Take up this challenge incorporating elements of barre, conditioning and cardio drills that will have you burning more calories even hours after you leave the barre! Join HICJUICE for a fruitful (and vege-ful too) complimentary 30 minutes sharing session introducing you to the magic of cold pressed juicing. Learn all about the benefits juicing can do to your body and get some juicy details on juice cleansing to maximise your detoxication journey while enjoying special samples of their newly revamped juice cleanses! 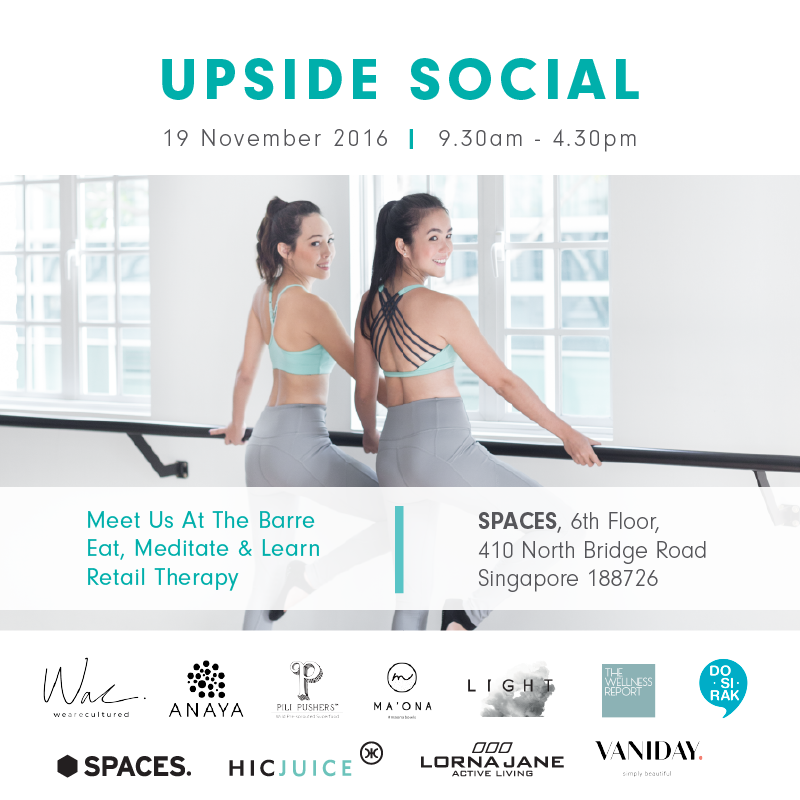 Expect only tough love from the ultimate barre bootcamp: get that heart pumping & sweat it out while you learn the essentials! Come experience your own healing power through various meditation techniques with Sherri Melwani from The Wellness Report. In this PAUSE initiative by The Wellness Report, you will learn how to find your own inner sanctuary instantly no matter where you are, and many special techniques to bring calm and serenity to the busy mind. Bring your date (or buddy) to the barre to experience that inner muscle shaking together in this class! Singles will get paired up so don't fret & be ready to mingle! No more fats and fads. 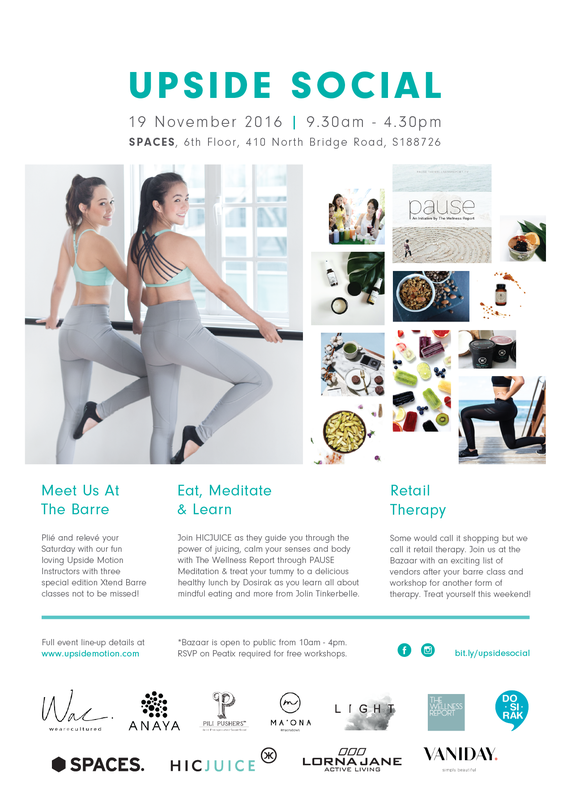 Join Jolin Tinkerbelle, a holistic health and wellness coach for a 1.5 hour lunch date as she guide you through the basics of holistic health and mindful eating, introducing you to superfoods that you can incorporate into your daily diet, how and what foods to eat to prevent ailments and everything you need to know about raw vegan. All participants of this workshop will also be provided with a healthy balanced bento lunch by Dosirak! We offer creative working environments with a unique entrepreneurial spirit. Originating in Amsterdam, Spaces was built on the idea that success breeds more success. We want to redefine the way work is done. That’s why we’ve cultivated a community of thinkers, achievers and imagineers. Plug into our energy and watch your world accelerate. The Wellness Report™ is a holistic approach to health, wellness and conscious living. Being the first multimedia wellness platform, our online magazine is built on palatable bite-sized concept videos, podcast, articles and online courses. Taking it offline, PAUSE An Initiative by The Wellness Report will be where the community meets. The intention is to encourage slow-living and how one should Pause For Wellness™. Jolin conducts nutrition and detox workshops, talks and events. Some of her clients include UOB, Citibank, DFS and Airbnb. She was also the health consultant of a cold-pressed juice company in Singapore and a personal guide. As a firm believer in a holistic way of maintaining health, not only does she share the effectiveness of eating right for a better body and reduced ailments, she also addresses the importance of physical, mental and spiritual well-being. She studied Holistic Nutrition and Advance Holistic Nutrition in the School of Natural Health Sciences, and spent 6 months in New Zealand in organic farms, volunteering at yoga retreat centres, as well as holistic communes. She is currently studying Homeopathy and modern ayurveda. Vaniday is the place to find and book beauty and wellness experiences online. Find your next massage salon, discover a trendy new hairdressers or a great nail salon. Discover beauty salons and services in your area and check the availability of dates and times for whenever suits you best. Lorna Jane is a global activewear brand with the mission to empower every woman to lead her best life through the Active Living philosophy and the daily practice of Move, Nourish and Believe. What started as a passion to deliver unique and inspiring designs to fellow gym lovers has given rise to a complete and simple approach to overall wellbeing and mindfulness, the Active Living philosophy. Active Living transcends the walls of the gyms and studios - it is a central part of tens of thousands of women’s lives worldwide. This ever-growing, global movement inspires women to live their best, lives through Active Living. Active Living is achieved through the daily practice of Move Nourish Believe. HICJUICE is one of our ways of complementing your move towards life’s lighter side. Raw, vegan, cold pressed and formulated by our nutritionists, HICJUICE is more than just juices and cleanses. We Are Cultured was born out of a journey walked; our first hand experience with leaky gut issues sparked off a revelation of how powerful the unseen is - the prowess of imperceptible 'good for you' bacteria, and its battle of our second brain, the gut. We hope to inspire a new generation of individuals to seek a wiser way of living by getting cultured on building a strong foundation with the gut and immunity. Our biotic-based creations are transparently and harmoniously crafted with the best, anchored in tradition, poised for the future. We Are Cultured’s AVA approved facility in Singapore is armed with rigorous protocols towards cross-contamination and allergen handling, dedicated to the discerning, cautious consumers. Step aside sherlock, we got our bases covered. Anaya Trigona honey is a unique and rare honey that is produced in very limited quantities by tiny stingless bees. Our Trigona honey is sourced from outreach projects and small communities that promote and practice sustainable farming methods through beekeeping. The bee colonies thrive on the nectar of over thirty varieties of plants and herbs – including Coconut, Echinacea, Agave, Vanilla, Roselle and Basil – that grow in our gardens. Through our recent travels to the Philippines, we had the opportunity to sample the amazing pili nut. This led us to visit the peninsular Bicol region of the Philippines, and meeting a community of independent farmers who grow these nuts on volcanic soils. The whole process from harvesting, to extracting the kernel, to dehydration is done by hand – it doesn’t get any more dedicated than this. We love the pili nuts so much; we thought we bring you a whole range of pili nut products! Our pili nuts are pre-sprouted by hand to make it a powerhouse of natural enzymes minerals and nutrition – namely magnesium, and Vitamins B1 & B6. They are then gently dehydrated to lock in these benefits, so you can enjoy that crisp yet creamy texture of this luxurious superfood. MA'ONA was created to conceptualize a free-spirited lifestyle; taking care of personal well being through wholesome food. Our smoothie bowls translates our inspiration for life into mouthfuls of guilt-free dessert which we wish to carry forward and spread the word of conscious eating for a soulful way of living. We especially enjoy having customers to chat with us to allow us to share more on the thoughts of spreading good vibe and kind words. Our all-time bestseller, Purple Bliss, is the perfect way for the whole year round of summer in Singapore. Other selections include: Cacao Berry and Green Popeye. A botanical fragrance atelier pouring candles handmade in small batches using the finest essential oils, infusions and accords.